They’re green, they’re sinister… and they’re underwear! Jasper Rabbit discovers the unspeakable horror of unmentionables in “Creepy Pair of Underwear!” by Aaron Reynolds. 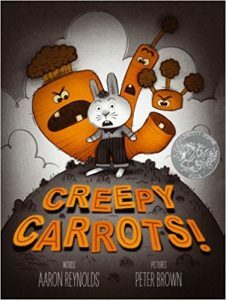 Devoted readers may remember Jasper Rabbit from his first book “Creepy Carrots!” in which Jasper encounters villainous vegetables. In his latest epic, Jasper is making a big-boy purchase of underwear with his mom when he finds the very cool, very creepy titular underwear. Jasper brings home a pair of the Frankenstein’s monster-inspired briefs only to discover a terrifying truth about them that is only revealed at night. Parents and caregivers will enjoy making the journey with Jasper as he searches for a solution to his underpants problem, and kids will love giggling at the juxtaposition between fear and underwear, the silliest thing they can imagine. If you liked “Creepy Pair of Underwear!” then you’ll love the aforementioned “Creepy Carrots!” as well as “I Am (Not) Scared” by Anna Kang and “The Dead Family Diaz” by P.J. Bracegirdle.